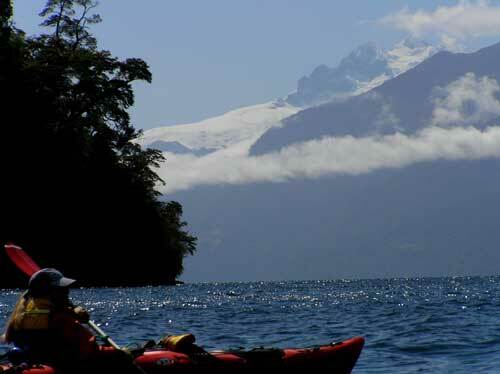 At 9:00 AM we will start driving from Puerto Varas to Petrohué entering Vicente Perez Rosales Nationa Park , the first one in Chile and the second in South America . 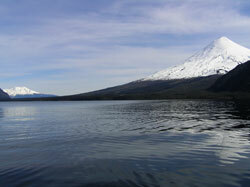 We will start paddling were Petrohué rivers born in the emerald waters of Todos Los Santos Lake located at the foot of the tremendous size Osorno volcanoe (2652m) with also great views of Puntiagudo and Calbuco volcanoes. 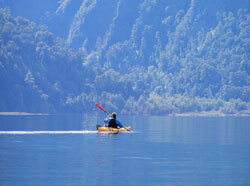 This lake was discovered by the Jesuist in 1670 the Day of All The Saints and because of that is it´s name. 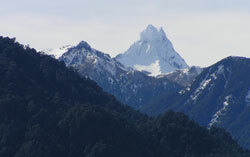 Then enjoy our box-lunch with great views of this magic mountains , sounds of the chucao bird (chucao tapaculo), go for a hike exploring the rainforest and then prepare to return to our put in in Petrohué , load the kayaks in the van and start a short walk to visit the famous Saltos del Petrohué (Petrohue Waterfalls carved in lava rocks) returning to Puerto Varas aprox. 5 PM. 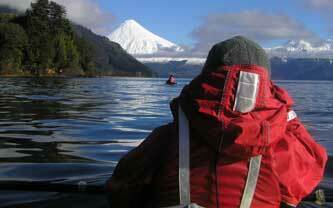 Transportation in private vehicle from your Hotel in Puerto Varas to Petrohué and back to Puerto Varas. Complete Safety Talk ...before the trips starts. 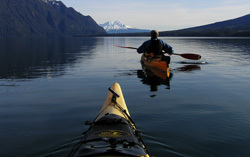 English speaking seakayak guide , certified by the British Canoe Union as a BCU 4STAR Seakayak Award with NOLS Trainning. VHF marine radio , celular tand sateplite phone , elephone, satelite photo. 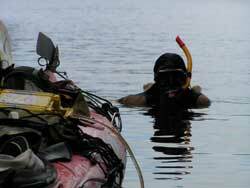 It´s not a proper diving activity (like scuba diving) , it´s just enjoying getting underwater with a mask. * Ask for your recommended gear list. 3 days , paddling , camping till Peulla). * 5 Days (including also hiking,camping Termas del Callao Hotsprings). 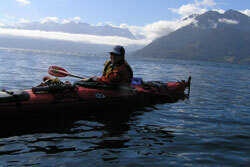 -complete seakayak safety talk including seakayak rescue simulation before paddling. 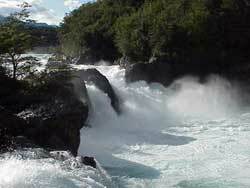 -visit Saltos de Petrohué (Petrohue Waterfalls) /ticket not inluded. Contemplative attitude and respect for the existing ecosystem. Physical state and health compatible with the activity to be performed. Understand that this is team activity in the outdoors and the participation of each person at each stage is fundamental. Before the trip you must send by fax the Release of Liability form signed. To have read and clearly understand the General Conditions section. 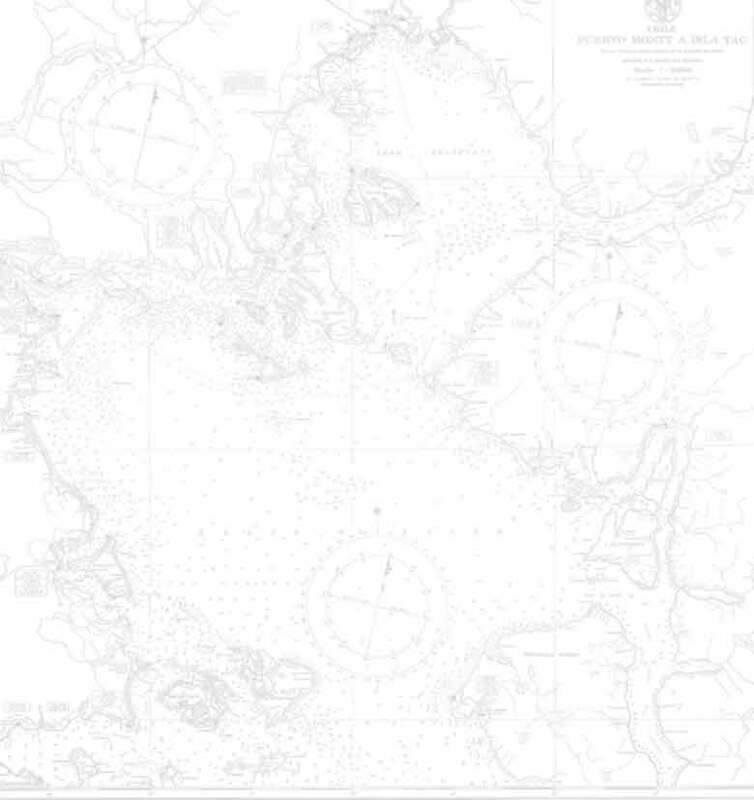 The trip has been planned with the consideration of those without previous experience. Before we start paddling, we will have a complete discussion and practice session in the beach covering rescue procedures and paddling strokes in order that our participants feel more comfortable during the trip and can really enjoy the navigation. To guarantee the security of our customers, we use very stable and confortable seakayaks imported from USA , Germany and Canada. 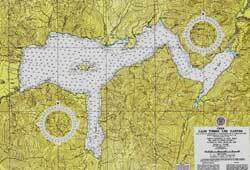 Probably we can expect some windy conditions during the navigation that can modify the itinerary. The trip will take place even if it rains. We will paddle aprox. 4 hours , with stops in between. Note that some of the photos were taken during our Winter trips. Note: This trip can be modified depending on weather and group conditions. Some of the photos in this page are from our trips during the winter. Do you wish to accommodate this trip to your needs ?